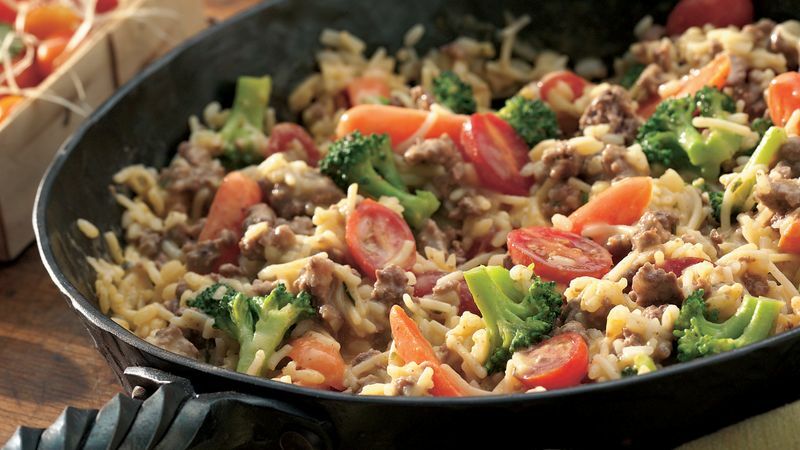 Cook beef in 12-inch skillet over medium heat 8 to 10 minutes, stirring occasionally, until brown; drain. Stir water, carrots, butter, pepper, rice mixture and contents of seasoning packet into beef. Heat to boiling; reduce heat. Cover and cook about 15 minutes or until rice and carrots are almost tender. Stir in broccoli. Cover and cook 5 minutes or until crisp-tender. Stir in tomatoes. Cook uncovered about 1 minute or until heated. If you're not thinking beef tonight, substitute ground turkey instead. Make this recipe even easier by simply purchasing already-cut veggies in the produce section or at the salad bar in the grocery store. When the cook is looking for a fuss-free night, serve this family-pleasing skillet meal with your favorite bakery rolls, sliced tomatoes and cucumbers, and brownies.